You will be delighted at the various choices you have when searching for a Sanibel Island hotel which is perfect for families and travelers on any type of budget. Families looking for condominium style units with super resort amenities including a kid’s club onsite should stay at the Sundial Beach Resort and Spa. 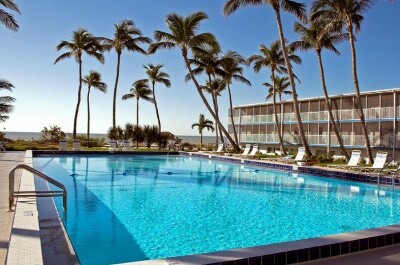 Solid mid-range choices include the West Wind Inn and Sanibel Island Beach Resort has a private beach. If you are looking for complimentary resort style amenities then you should stay at the Sanibel Inn or the Seaside Inn and there is additional value at the Song of the Sea and Sunset Beach Inn where you can enjoy free breakfast and complimentary watersport equipment. If you arrive by land or sea the Castaways Beach and Bay Cottages is where you will find kitchens and an onsite marina. 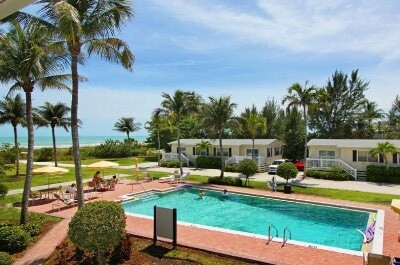 If your family is looking for an all condominium Sanibel Island hotel that boasts numerous onsite amenities, has a private beach area and is nearby to several attractions then you should stay at the Sundial Beach Resort and Spa. 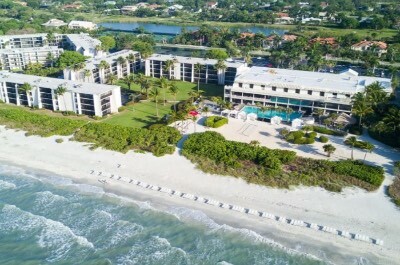 Located in the Beachview Country Club Estates area along the middle section of the southern coastline of the island, the Sundial Beach Resort and Spa offers a 1-mile long private beach overlooking the Gulf of Mexico and is around 1.5-miles away from the Sanibel Historical Museum and Village. 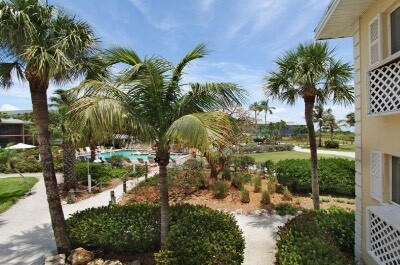 The Sundial Beach Resort and Spa is composed of numerous modern four story architecturally designed buildings that contain 206 condominium style units that feature a contemporary interior. Studios are 603 square feet with an open floorplan that has a full kitchen and living/sleeping area as well as a private screened balcony that has island views. One-bedroom condominiums are sized between 704 to 920 square feet with a choice of bedding options, a full kitchen, a separate living room and private screened balcony that has an island, gulf or coastal view. Two and three-bedroom units range in size from 1,150 to 1,580 square feet with a separate living room, a full kitchen, 2-bathrooms and a screened balcony that offers views of the coast, gulf island or beachfront. The Sundial Beach Resort and Spa has a perfect 1-mile beach of white sand where you can lounge and you have access to complimentary watersport equipment onsite. There are scheduled activities for adults and children by a full time entertainment staff to keep families busy as well as free bicycles for land adventures. The Sundial Beach Resort and Spa is close to numerous attractions such as the Bailey-Matthews National Shell Museum, the Sanibel Island Lighthouse and you are less than 1.5-miles from the Sanibel Moorings Botanical Gardens. The resort has several onsite amenities that include five freshwater swimming pools including a splash pool with a waterslide for kids, barbeque grills, a fitness center, tennis courts and a full service spa. Dining onsite is plentiful with the Sea Breeze Cafe open for all three meals, the Shima Japanese Steakhouse and Sushi Bar serves dinner and lunch can be found at the Turtle’s Pool and Beach Bar as well as a Slice of Paradise. Nightlife onsite includes drinks at one of the lounges, watching the sunset and there is live entertainment on selected evening within the resort area. If you want to find an upper-mid-range Sanibel Island hotel that is nice for families, has a private beach and is close to nearby attractions then the West Wind Inn is superb. Located within the center portion of the southern shoreline of the island along West Gulf Drive, the West Wind Inn has a 500-foot private beach and is 1.5-miles away from the J.N. “Ding” Darling National Wildlife Refuge. The West Wind Inn has a modern two floor architectural style with 103 rooms and suites that boast a colonial decor. Rooms are spacious with a choice of bedding, a small kitchenette (microwave and refrigerator) and a balcony that offers a view of the gardens or Gulf of Mexico. Studio units are larger with an open floorplan that includes bedding, a full kitchen and private balcony that boasts a garden or gulf front view. Rooms and studios can be adjoined to make larger suites for families. The West Wind Inn has easy access to a 500-foot private beach where you can lounge on the sand and the swimming is good. Watersport equipment can be rented nearby offsite. The West Wind Inn allows for an easy drive to many attractions such as the Sanibel Historical Museum and Village, the Clinic for the Rehabilitation of Wildlife (CROW) and you are less than 6-miles away from the Sanibel Island Lighthouse. The property has a freshwater swimming pool with poolside service, shuffle board and tennis courts onsite. Dining includes the Upper Deck Pool Bar for lunch and the Normandie Seaside Cafe is open for all three meals. Offsite dining within a short distance includes the Sandbar for steaks, the Clam Shack has seafood and Cip’s Place prepares international specialties. Nightlife is subdued with a quiet walk along the beach shelling or watching the sunset and you can venture to the Sanibel Grill for a pub style atmosphere. The Seaside Inn is an ideal mid-range value oriented Sanibel Island hotel that is perfect for all types of travelers including families that want easy access to the beach and nearby attractions as well as a quiet atmosphere. Located on the southeastern coastline of the island in the Kinzie Island area, the Seaside Inn boasts is just a few steps away from a nice white sand beach and is less than 1-mile to the Sanibel Island Lighthouse. The Seaside Inn is composed of one and two story modern buildings that contain 32 rooms, suites as well as cottages that feature a simplistic contemporary interior. Rooms are 320 square feet with two queen size beds, a small kitchenette (microwave and refrigerator) and a private screened balcony/porch that boasts partial-gulf or gulf front views. One-bedroom suites have 420 square feet and three-bedroom suites are sized at 620 square feet with a separate living room, full kitchen as well as a private screened balcony/porch that has a partial-gulf or full gulf front view. One-bedroom Cottages are sized at 475 square feet with a separate living room that has a sofa sleeper, full kitchen and private screened porch that sports gulf front views. The Seaside Inn is just steps away a from a beautiful white sand beach area where you will find complimentary beach and watersport equipment as well as nice swimming conditions. The property also offers complimentary bicycles for land travel and you have free access to the Dunes Golf and Tennis Club where you can indulge in several unique activities. The Seaside Inn is within 4-miles to the Bailey-Matthews National Shell Museum, the J.N. “Ding” Darling National Wildlife Refuge and you are within an easy walk to the Sanibel Moorings Botanical Gardens. The hotel has a freshwater swimming pool with barbeque grills and you receive a free bottle of wine at check-in. Dining includes a complimentary breakfast basket but there is not a restaurant onsite. Offsite dining options within a short distance include the Lighthouse Cafe, the Blue Coyote Supper Club and Matzaluna prepares Italian specialties. Nightlife is superb at the Dunes Golf and Tennis Club with dancing, live music, comedy shows as well as karaoke and you can have a cold beverage at Doc Ford’s Rum Bar and Grill. When you are searching for a mid-range Sanibel Island hotel that is ideal for couples who are looking for complimentary amenities, easy beach access and a laid-back atmosphere then the Song of the Sea is ideal. Located on the southeastern shoreline of the island East Gulf Drive, the Song of the Sea is situated on a private beachfront overlooking the Gulf of Mexico and is 1.5-miles away from the Sanibel Island Lighthouse. The Song of the Sea has a modern two floor architectural style with 30 rooms and suites that offer a colonial plantation decor. Rooms are sized at 370 square feet with a choice of bedding, a small full kitchen including a stove and private screened balcony/porch with partial-gulf or gulf front views. One-bedroom suites have 564 square feet with a choice of bedding, a separate living room that has a sofa sleeper, small kitchen including a stove and a private screened balcony that boasts views of the gulf front. The Song of the Sea has perfect access to a private beach where you will find plenty of room to lounge with good swimming opportunities, shelling is great, complimentary kayaks as well as standup paddleboards and you have use of bicycles for land travel. The Song of the Sea provides for an easy drive to several attractions such as the Sanibel Historical Museum and Village, the Sanibel Captiva Conservation Foundation and you are within a 5-minute walk to the Sanibel Moorings Botanical Gardens. The property has a freshwater swimming pool with barbeque grills, shuffle board, tennis courts (including free use of racquets and balls) and you have complimentary access to the Dunes Golf and Tennis Club where you will find an assortment of activities during the day as well as night. Dining onsite includes a complimentary bottle of wine at check-in and a free continental breakfast. Dining nearby within a short distance includes II Cielo for seafood, Gramma Dot’s Seaside Saloon and the Shima Japanese Steakhouse and Sushi Bar. Nightlife is superb at the Dunes Golf and Tennis Club where you can dance, listen to live music, play bingo and sing karaoke or you can visit Herb Strauss Schoolhouse Theater for a live performance. The Sunset Beach Inn is a superb value oriented mid-range Sanibel Island hotel that offers complimentary amenities on and offsite as well as quick beach access for families to enjoy. Located within the center of the southern coastline of the island along West Gulf Drive, the Sunset Beach Inn offers a dedicated pathway to a 350-foot private beach area that overlooks the Gulf of Mexico and is within 1-mile to the Bailey-Matthews National Shell Museum. The Sunset Beach Inn has a modern two story architectural design with 46 rooms and suites that sport a mid-century modern interior. Rooms range in size from 264 to 320 square feet with a choice of bedding, a small kitchenette (microwave and refrigerator) and a screened shared balcony that offers views of the gardens, gulf or pool (Sanibel rooms do not offer a shared balcony and garden view rooms have a private balcony). One-bedroom suites have 700 square feet with a separate living room, full kitchen and private screened balcony that offers views of the garden. Two-bedroom suites are 800 square feet with a variety of bedding options, a separate living room, full kitchen and a screened balcony that boasts a partial-gulf or full gulf view. The Sunset Beach Inn provides for easy access to a 350-foot private beach where you will find good swimming, complimentary kayaks as well as standup paddleboards, plenty of sand to lounge on and there are also complimentary bicycles for land adventures. The resort also provides complimentary access to the Dunes Golf and Tennis Club for offsite entertainment during the day and night. The Sunset Beach Inn is nearby to many attractions on the island that include the Clinic for the Rehabilitation of Wildlife (CROW), the Sanibel Historical Museum and Village and you are 1.5-miles to the J.N. “Ding: Darling National Wildlife Refuge. The property boasts a large freshwater swimming pool that overlooks the gulf, barbeque grill, shuffle board and tennis courts onsite. Dining onsite includes a complimentary continental breakfast but there is no other restaurant on premise. Offsite dining options within a short distance from the hotel includes the Sandbar for steaks, Bleu Rendez-Vous French Bistro and the Sanibel Cafe. Nightlife involves a short drive to the Dunes Golf and Tennis Club where you will find live music, bingo, karaoke and comedy nights or you can have a cold libation at the Sanibel Grill. If you are interested in a mid-range Sanibel Island hotel that boasts complimentary onsite amenities, a private beachfront and is perfect for families then you should stay at the Sanibel Inn. Located on the southeastern portion of the island along East Gulf Drive, the Sanibel Inn has dedicated access to a 600-foot private beach overlooking the Gulf of Mexico and is within 2-blocks to the Sanibel Moorings Botanical Gardens. The Sanibel Inn has a modern four floor architectural style with 93 rooms and suites which feature a Florida beach decor. Guest rooms are sized at 450 square feet with a choice of bedding, a small kitchenette (microwave and refrigerator) and a screened porch that offers a gulf or gulf front view. One-bedroom suites are 630 square feet with a king size bed, a separate living room that has a sofa sleeper, small kitchenette and a screened porch that boast a gulf or gulf front view. Two-bedroom condominiums have over 1,000 square feet with a separate living room, full kitchen, 2-bathrooms and a screened porch that offers gulf views. The Sanibel Inn is situated on a 600-foot private beachfront where you will find plenty of space to relax, a tiki bar with drink service and there are complimentary kayaks, paddleboards as well as bicycles for land adventures. The Sanibel Inn is nearby to many attractions on the island such as the Bailey-Matthews National Shell Museum, Pond Apple Park and the Sanibel Captiva Conservation Foundation. The Sanibel Inn offers complimentary access to the Dunes Golf and Tennis Club where you will find a variety of entertainment platforms during the day and night. The resort boasts a freshwater swimming pool with barbeque grills and tennis courts onsite. Dining onsite includes the Island Time Bar and Grill for all three meals poolside. There are several offsite eateries within a short distance that include Matzaluna for Italian, Cip’s Place has International specialties and the Clam Shack serves seafood. Nightlife can be found at the Dunes Golf and Tennis Club where you can dance, play bingo, trivia nights and live music. The Sanibel Island Beach Resort is an ideal Sanibel Island hotel for younger families who are searching for easy beach access, a few amenities onsite and comfortable accommodations. Located 1-block from Periwinkle Way along Middle Gulf Drive, the Sanibel Island Beach Resort is situated on the southeastern shoreline of the island overlooking the Gulf of Mexico on the beachfront. The Sanibel Island Beach Resort has a modern two story architectural design with 98 rooms and suites that feature a contemporary beach interior. All rooms and suites are furnished with a small kitchenette that includes a microwave and refrigerator. Standard rooms have 240 square feet with a choice of bedding and views of the area, pool or gulf from a shared balcony. One-bedroom suites are sized at 600 square feet with a choice of bedding, a separate living room and shared balcony with views of the gulf, pool or surrounding area. The Sanibel Island Beach Resort is just steps away from a white sand beach where you will find beach volleyball, plenty of places to lounge and you can arrange for watersport adventures offsite through vendors. There are also bicycle rentals onsite for your convenience. The resort is nearby to several attractions such as the Sanibel Moorings Botanical Gardens, the Sanibel Island Lighthouse and you are less than 5-miles to the J.N. “Ding” Darling National Wildlife Refuge. The Sanibel Island Beach Resort has a freshwater swimming pool with a sundeck and there is a poolside tiki bar. Dining onsite includes La Bella Vita Ristorante for breakfast and dinner as well as several offsite dining options within a short distance that include the Blue Coyote Supper Club, II Cielo prepares seafood and Sweet Melissa’s Cafe serves European favorites. Nightlife is subdued with a sunset drink at the tiki bar, a walk along the beach or you can have a cold libation at Turtle’s Beach and Pool Bar. 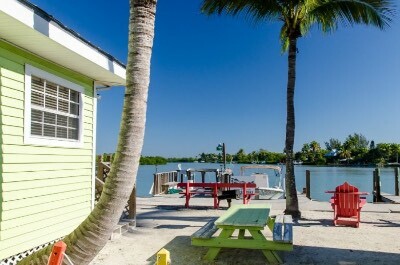 Whether you arrive by boat or land the Castaways Beach and Bay Cottages is a perfect Sanibel Island hotel for all types of travelers including families that are looking for quick beach access and an onsite marina. Located along the Sanibel Captiva Road between the Gulf of Mexico and Sunset Bay, the Castaways Beach and Bay Cottages are within a 5-minute walk to Turner Beach as well as Blind Pass Beach and you are 5-miles away from the J.N. “Ding” Darling National Wildlife Refuge. The Castaways Beach and Bay Cottages are composed of 40 brightly colored cottages that sport an Old Florida charm and rustic architectural design. All cottages are furnished with a screened porch that offers views of the pool, marina, Sunset Bay or the Gulf of Mexico and most units feature an outside barbeque grill. Efficiency units are the smallest with a queen size bed and small kitchenette (microwave and refrigerator). Studio units have an open floorplan with a full kitchen, sofa sleeper and choice of bedding. One-bedroom units have varying floorplans with a choice of bedding, full kitchen and a separate living room. Two-bedroom cottages are the largest including bi-level units that are furnished with a choice of bedding options, a separate living room that has a sofa sleeper and a full kitchen. The Castaways Beach and Bay Cottages are just minutes from two beach areas where you will find plenty of room to lounge as well as hunt for shells and there is the Castaway Marina onsite where you can rent watersport equipment or moor your boat while you stay. The Castaways Beach and Bay Cottages are close to many attractions which include the Bailey-Matthews National Shell Museum, the Sanibel Historical Museum and Village as well as the Clinic for the Rehabilitation of Wildlife (CROW). The property has a small freshwater swimming pool that is surrounded by barbeque grills and you have access to a nearby full service spa. Dining includes a leisurely home cooked meal in your cottage and there is a grocery store within a short drive to stock up on provisions. Also within 1-block of the property there is the Mad Hatter Restaurant for steaks, the Sunset Grill prepares seafood and the Lazy Flamingo. Nightlife can include a walk on the beach at sunset or you can take a short drive for libations at Doc Ford’s Rum Bar and Grille Captiva.